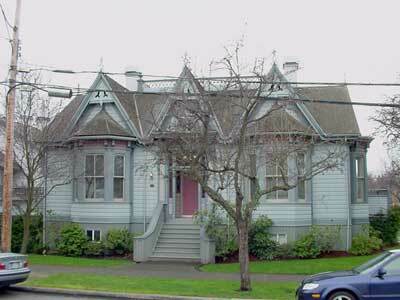 Gothic Revival was a fashionable style for country houses in the 1860s, and the archival photo of this house at its original location on Rockland Av in a Garry oak meadow is typical. Rockland Av, or Belcher St as it was known then, was just a country road with large estates on either side. Four other extant Gothic Revival houses (1462 Rockland Av, 1861; 1156 Fort St, 1862, Fernwood; 1342 Pandora Av, 1883, Fernwood; and 1139 Burdett St, 1893, Fairfield) were built nearby northwest of this one, before subdivision into small lots had begun. The residence was originally located just east of Langham Court on Rockland. It was moved to its present location in 1889, to make way for another, more elaborate home. Green Gables is a 1-storey end-gabled building with open eaves, a balustraded widow’s walk, three gables in the front, and two decked gables (later additions) in the rear. The front gables have decorative trusses at the peak, and the middle one has a multipaned window with a triangular top and a drip mould in its peak above the door. The original gables have finials. These are the principal Gothic Revival features of the house. However, many of the details are Italianate, indicating the late date of the house’s design, when other styles were becoming more popular. The roof has a shallower pitch than the typical earlier Gothic house. The entry doorframe, crowned by an entablature resting on brackets and pilasters and with dentils in its frieze, and its sidelights and transom, is Classical or Renaissance, rather than Gothic Revival. The angled bay windows in the two front gables and on the two sides of the building are pure Italianate, with entablatures similar to the front door. At its original location the house appears to have sat up on a crawl space. Today it is on an excavated basement, with twin garages entered from the rear. Additional living space has been gained by the addition of decked gables at the rear and windows in the two side gables. First-floor windows have been converted to entry doors on the sides. The house is clad in drop siding. No firm evidence has been found to indicate whether this cottage was built while HBC Chief Factor Joseph William MacKay (1007 Johnson St, Harris Green) owned the property or the Wards. It is possible that MacKay built part of it in 1874, and then sold it to Robert Ward, who finished it. Matthew Trotter Johnston (c.1841-1911) and his family were likely the first occupants of the house after it was moved to its present location. They lived here 1893-97 and the following year retired to the Cowichan Valley. Matthew was born in Berwickshire, Scotland, who came to BC in 1865 and for a time lived in Port Alberni and worked for the Anderson and Anderson Saw Mill Co. When he came to Victoria, he worked first for Sproat & Co and then for Findlay, Durham & Co; he eventually became manager. In 1868 he married Letitia Elizabeth Leggatt (1851-1925), of Surrey, England. He and Robert Edwin Jackson, a barrister, established the BC Benevolent Society in 1872 to aid the community’s poor. Stephen Yardley Wootton (1861-1918) lived here 1898-1901, and then moved to his new house next door at 1259 Richardson by 1902. Born in Victoria to Capt Henry Wootton and Eliza Yardley, Stephen was a barrister who worked at the office of the registrar-general of titles for about 20 years. He married Ethel Phillipa Smith (1867-1966) of London, England, after her arrival here in 1897. Stephen’s brother Edward Edwin Wootton owned 252 Memorial Cr (Fairfield). John Carthew, manager of BC Canning Co, lived here in 1902, followed by Mortimer J. Appleby in 1903. The house was vacant in 1904. Retired judge Alfred Alexander Freeman (1836-1926) lived here in 1908-13. Born in Hayward County, TN, Alfred came to Canada with his wife Martha Elizabeth (Padgett, 1834-1927) in 1907. He practised law in Tennessee before moving to Washington. He was Assistant Attorney-General for 10 years, ran his own practise from 1885-90, then was an Associate Supreme Court Justice in New Mexico for five years. He retired to Victoria in 1907. He went into the lumber business with his son-in-law James Oscar Cameron (1320 Purcell Pl, Rockland), as Cameron Lumber Co vice-president until just before his death. James married Beatrix Freeman in New Mexico in 1893, and the two couples came to Victoria the same year. The Camerons lived here with the Freemans in 1910-12 until 1320 Purcell was built, then both couples moved there. Richard and Ada Margaret Richards (1139 Burdett St, Fairfield) lived here in 1920-21. By 1923 this was converted into a nursing home called Fairfield, then Mossfield Convalescent Home. From 1926-early 1940s this was the Belfield Convalescent Home, owned and operated by Jean Campbell (1879-1944) and Helen Carson Currie (1865-1942). Jean was a native of New Zealand, and practised nursing from her arrival here in 1908 for 35 years. Helen, also a nurse, was born in Edinburgh, Scotland, and lived in New Zealand before moving here with Jean in 1908. In the late 1940s, this was the Hollandia Nursing House, owned and operated by William F. and Willenpje (possibly Willemina) Wolfe. It eventually became Green Gables Rest Home, then a rooming house. In the early 1990s it was renovated and converted into a strata duplex, with condominium units behind.